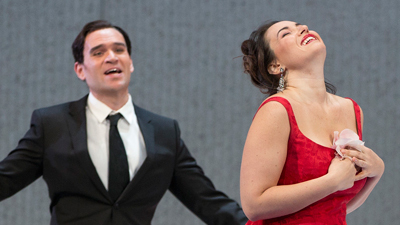 There’s a good reason La Traviata is one of the best-known, and best-loved, operas of all time. Verdi’s exquisite music conveys every bit of emotion felt by the gorgeous, successful Parisian courtesan Violetta (Angela Gheorghiu). 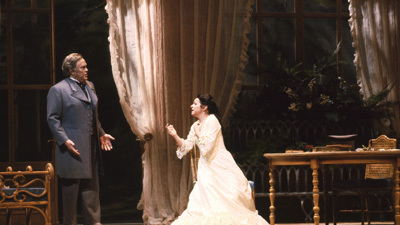 From the frenzy of her pleasure-filled life, to the suddenness with which she falls in love with handsome young Alfredo (Jonas Kaufmann in his Met debut season and role), to the heart-rending decision to leave him for the sake of his family—Verdi’s opera tells of true love, taken to its altruistic, poignant height. Anthony Michaels-Moore is Alfredo’s manipulative father, Germont.